Summary: An investigation that delves into the great beyond. Station: WTAE Channel 4 Reporter: Jim Parsons When it Aired: Nov. 28 Running Time: 5 minutes Visuals: * Paranormal investigators praying before an investigation. * An extreme close-up of a spooky-looking doll! Highlights: * When Blair Witch Project-style footage airs, complete with scary sounds like horrific, heavy breathing. During the montage, a man confronts a "ghost": "I need to see you now. Come on, you've picked on everybody else, now pick on me." * When Parsons begins, "Picking a fight with a ghost is something investigators from Pittsburgh Paranormal Society do routinely. Sometimes, they say, they get a response." * When a female PPS member says, "There are a lot of people out there that have things going on in their home and they want to know what it is." * Parsons continues, "And these investigators say they find out with gadgets. Lots and lots of gadgets. ... [S]ometimes, they say, they pick up a voice or an image. * When Parsons provides us with an example of a paranormal sighting: "At R&R Station Restaurant in Mount Pleasant, another supposedly haunted building, [this member] and his crew snapped pictures in the dark. Later, they looked closely at the photo of this empty hallway ... they saw the distorted image [in a mirror] of what they claim is a man ... who resembles [a man] who owned this building 100 years ago when it was the East End Hotel." * When Pitt psychology professor Thomas McBurney posits that hunting for spirits is "the same as looking at clouds and seeing elephants and whatnot. ... There is an explanation, but these people are not qualified to find it. ... [B]ecause they don't have the scientific training to know how the mind works and how physics works." * When Ryan Buell, the founder of the student group Paranormal Research Society at State College, says, "I worked in a case in Pittsburgh that was a demonic haunting. ... Blood would materialize on the walls, um, I guess, crucifixes were bending ... I mean, just crazy things." What We Learned: These Ghostbusters don't charge! Unanswered Question: Who you gonna call? News Value: 3. This certainly isn't Parsons' best work, but that's got a lot to do with the assignment. I'll just call him a casualty of the November ratings war. Summary: Getting a vibe on workout equipment that could change your life! 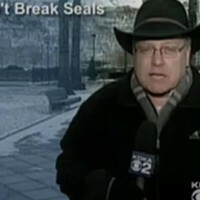 Station: KDKA Channel 2 Reporter: Sonni Abatta When it Aired: Nov. 29 Running Time: 4 minutes, 3 seconds Visuals: * When Abatta kneels before a "vibration plate," but never mounts it -- much to the dismay of many a male viewer, I'm sure. * Patients performing assorted exercises on the "vibration plate." Highlights: * When anchor Ken Rice makes some pretty hefty claims in his introduction: "[W]hat if we told you there's a piece of workout equipment that could get you great results in less than half the time? ... Sonni Abatta shows us what it's all about." * When Abatta exalts, "Well, it's called 'whole-body vibration training': Essentially it is strength training on a vibrating plate, and it's for anyone. ... [I]t may be just what you need to shake your workout to the next level." * When Dr. Dan DiCesaro, of DiCesaro Spine and Sport, explains, "What your body's doing there is trying to equalize itself while standing on the plate, so muscle fibers in your body are firing, which you wouldn't get just doing anything on a normal floor." * Abatta's homework on the "innovation": "Now, some studies say the reason whole-body vibration training works better than traditional strength training on a steel surface is because more muscle fibers are twitching." * When she adds, "And it may be good for more for more than just an intense workout. For [this man], it's nothing short of a miracle machine. [He] has ankylosing spondilitis, which is a condition that fuses the spine and limits movement." * When the afflicted man testifies, "[I]t's like getting your life back, is what it is." * When DiCesaro claims people can see results in an average of two weeks, and Abatta challenges him: "You know, that sounds too good to be true," she says. DiCesaro agrees: "Absolutely does. I wouldn't believe unless I experienced it myself, personally and with our clients. * Near the end of the piece, when Abatta cautions, "[B]ut despite those who sing its praises, of course, it is not without controversy. One study says you can get similar results by just doing cardio with your regular strength training ..." What We Learned: Sonni sure doesn't "show us" the way WTAE's Kelly "Pole-Dance" Frey does! Unanswered Question: Is it just possible there is a placebo effect at work here? News Value: 1. Let's compare Abatta's story to Parsons'. Parsons gives fair time to both sides; Abatta adds the precautionary statement only as an addendum to an infomercial for a local medical practice. 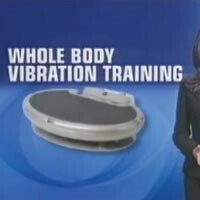 Not giving fair time to dissenting opinions (which abound when it comes to "vibration plates") is a huge issue with local television news.